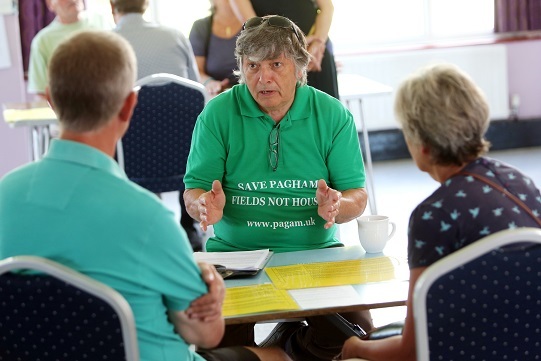 DETERMINED Pagham councillors have vowed to carry on fighting against more than 1,000 homes. The parish council members said there would be no let in their battle to get the best for the area in face of the 1,200 planned dwellings. They have £22,000 set aside to fund any legal challenge or acquire expert advice they believe is necessary to continue their protests. She made her comments at the council’s latest meeting after members agreed to spend £800 on a ‘focused review’ by an experienced former local authority planning officer of the council’s position. The review will concentrate on how the council should proceed regarding the adoption by Arun District Council of its local plan, which establishes the principle of the large-scale housing on sites known as Pagham North and Pagham South. Also included in the work will be the parish council’s draft neighbourhood plan, which needs to be approved by residents, on which work has been halted. It details planning issues such as protecting heritage sites and allocating small-scale housing areas. The council is also involved in opposing the four planning applications which have been submitted for Pagham North and Pagham South and which Arun has yet to debate. The council could consider a meeting with Pagham and Aldwick Greenfield Movement (PAGAM) to explain the latest situation. “Community engagement meetings are a good idea. But quite a lot of information goes out from us,” he said. The idea of the meeting was raised by a PAGAM committee member, June Collins. She called for the parish council to do more to explain its role. “Nobody from the parish council turned up when Arun approved the local plan as a show of support. That was all we were asking for,” she said. Cllr Salter said residents were able to attend and speak at all of the parish council’s meetings at the village hall.